The DMARC Housing Stability Fund provides emergency financial assistance to preventfamilies from becoming homeless. DMARC works in partnership with Polk County General Assistance to process program requests for rent and utilities assistance. In Iowa, April 1 marks the end of the winter moratorium that prevents most low-income residents from having their utilities shut off. Many people can fall behind on utility bills during the winter (especially if it’s an extra cold one) and face a utility shutoff notice once April arrives. This situation can also lead to increased evictions in the spring as some families choose to keep their gas and electric on by paying past-due utility bills rather than their full amount of rent. Programs funds are limited and disbursed only when available. Intake process requires photo identification and documentation of needed assistance, including household income and expense verification. One request per household in a 12-month period. Requests are confidential and assistance is provided on a non-discriminatory basis. Have you ever thought about what it might be like to not have heat when it’s cold? Or to be faced with the possibility of eviction? Maybe you’ve experienced these hardships yourself. But you can help! 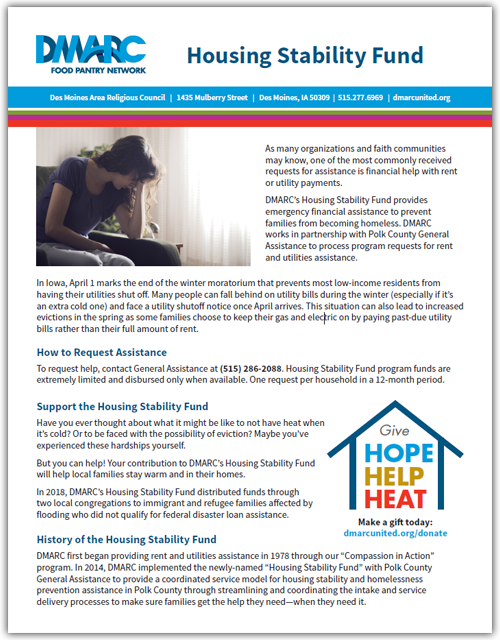 Your contribution to DMARC’s Housing Stability Fund will help local families stay warm and in their homes. In 2018, DMARC’s Housing Stability Fund distributed funds through two local congregations to immigrant and refugee families affected by flooding who did not qualify for federal disaster loan assistance. DMARC first began providing rent and utilities assistance in 1978 through our “Compassion in Action” program. In 2014, DMARC implemented the newly-named “Housing Stability Fund” with Polk County General Assistance to provide a coordinated service model for housing stability and homelessness prevention assistance in Polk County through streamlining and coordinating the intake and service delivery processes to make sure families get the help they need—when they need it. This fact sheet, published by the National Partnership for Women & Families in October 2014, explores what Iowa’s gender-based wage gap means economically for women and our state. Founded in 1971 as the Women’s Legal Defense Fund, the National Partnership for Women & Families is a nonprofit, nonpartisan 501(c)3 organization located in Washington, D.C. This brief, published by the National Partnership for Women & Families in April 2015, examines America’s gender-based wage gap, binds of discrimination, and a path forward. Founded in 1971 as the Women’s Legal Defense Fund, the National Partnership for Women & Families is a nonprofit, nonpartisan 501(c)3 organization located in Washington, D.C. In January 2014, the Housing Strategies Taskforce of the Polk County Housing Continuum published this Report Brief that examines the incidence, causes, and impact of homelessness. The Brief also provides recommendations to address housing instability and homelessness among families with children residing in Greater Des Moines. 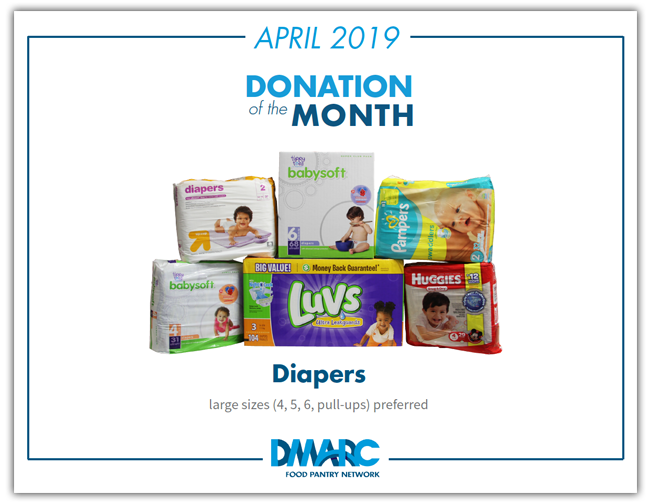 In 2011, United Way of Central Iowa commissioned DMARC to conduct an independent assessment of the scope of programs available to respond to basic needs of low-income families and individuals in Central Iowa. This is a brief summary of the full 2012 report the United Way of Central Iowa commissioned DMARC in 2011, to conduct an independent assessment of the scope of programs available to respond to basic needs of low-income families and individuals in Central Iowa.